If you're looking for some different onscreen humor, then maybe the new British comedy Sally4ever is the TV show you're looking for. Julia Davis, who writes, directs and stars in the series, brings her own brand of dark and silly laughs to HBO, in addition to the recent U.S. remake of the comedy Camping. Catherine Shepherd stars as 'Sally', who's been living a dull suburban life with her boyfriend for over ten years and working a boring job until she meets 'Emma' (played by Julia Davis) and embarks on a wild affair with the seductive and sociopathic actress and singer. The only problem is when you let the narcissistic Emma in to your life, it's hard to escape her. These series launch billboards for the love story and workplace comedy were snapped along Pico Boulevard and Santa Monica boulevard from November 4 to November 13, 2018. 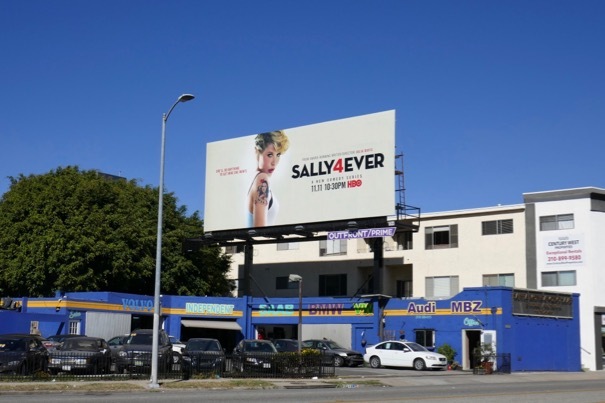 If you've grown tired of America's fall season sitcom offerings, maybe give Sally4Ever a try for a comedy with a bit of British wit and bite.